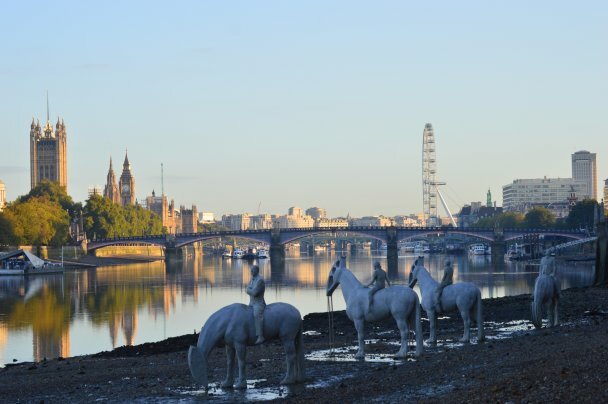 Four mounted pallid horses emerge from beneath the ebbing Thames. Superficially they acknowledge London’s commercial history and the arterial highway of the river. 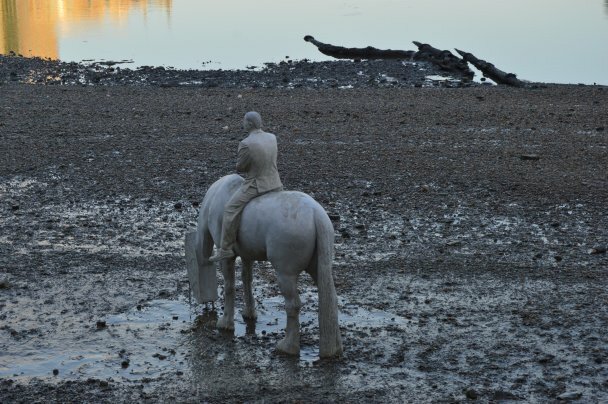 Temporarily installed, The Rising Tide, sculpted by English artist Jason deCaires Taylor, promotes an agenda against our rapacious demand for fossil fuels. This is a work of sophisticated political activism. Constructed of ashen grey marine concrete with reinforced steel rods, their unsustainability correspondences with the impermanence of our fuel dependence. 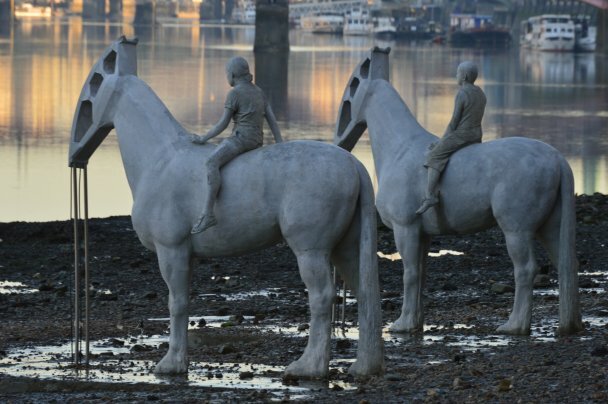 Humanising this campaign, the riders characterise the present and the future where, dressed in suits, two dispassionate, aged executives whose eyes are closed appear indifferent to the environmental, cultural and social future of the two children they flank; these children will inherit a dubious legacy. The mimiced rise and fall of the mutated oil pump horse heads is momentarily suspended. 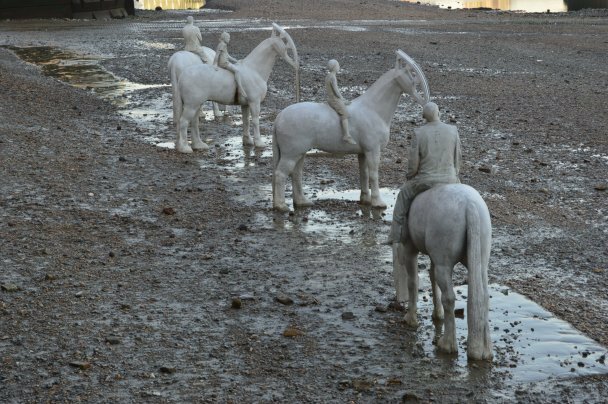 The childrens’ horses heads are raised whilst the children survey the land and seascape of the future, in contrast the horse heads of the comfortably paunched men are lowered by masterly command, taking rather than gifting precious resources as the tide turns against them. 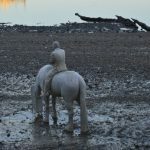 In blending the semiotics of the horse as an engine and their heads as the ‘nodding donkey’ oil pump, the sculptor’s imagination has infused art as objection within a disturbing cast. These innovative sculptures are significantly more visually compelling than reams of complex climate data. British viewers familiar with Gormley’s iron men at Another Place, Crosby Beach, Liverpool, rising eerily from the regressing sea are perhaps less aware of Jason deCaires Taylor’s international underwater installations in Cancun and the Bahamas – his next to be 300 sculptures at Lanzarote. 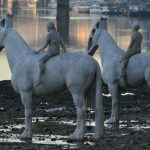 As a member of a later generation of sculptors, Jason deCaires Taylor, 41, who graduated from the London Institute of Arts is also a diving instructor and underwater naturalist, has expressed political intent to inspire our nurturing of the aquatic environment and its conservation. 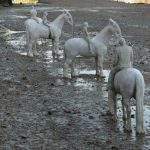 Although located less than a mile south of the Houses of Parliament, on the eastern bank of the Thames curve, these sculptures are perhaps just a little too far from the selfie-snapshots of the millions of Londoners and tourists who daily traverse Westminster Bridge. 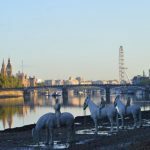 The additional challenge of tidal dependent accessibility may further inhibit some of those who have the desire to see the sculptures and the brevity of their installation – a mere month – is a further restriction. Yet despite these three apparent constraints, the sustained influence of The Rising Tide lies in the perpetuation of its potent iconography across the internet as a thought provoking and intelligent protest. The Rising Tide is visible from the walkway behind Carmelford House, 87-90 Albert Embankment, Vauxhall, SE1 7TW.These sculptures were commissioned by Totally Thames Festival whose supporters include Arts Council England and The Mayor of London. Humanising the Landscape: The outdoor placement of twentieth-century sculpture and its aesthetic impact upon the viewer.